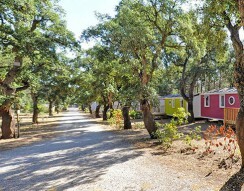 A great outdoors holiday awaits you at any of our campsites in the South of France: campsites in south western france, campsites south-eastern France, campsites in the Mediterranean coast. Flower Campings brings together campsites in wonderful locations in the countryside or by the sea or ocean, selected for their quality pitches and holiday rentals, facilities and services. Nature breaks and family holidays? 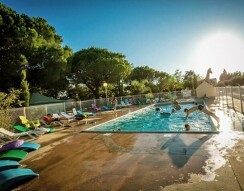 Discover the campsites in the south of France; select among the multitude of destinations and book your stay online with our secure payment service. Then you can simply relax and look forward to a great holiday whatever the themes or desires for your summer break. 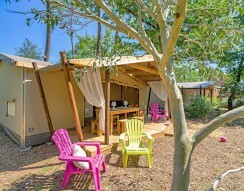 If you have your heart set on discovering the wine routes of the south of France or you are perhaps planning a cycling tour, looking for a campsite by the beach and near theme parks for your children… Flower Campings’ holiday ideas section can guide you to the campsite that suits you best! Enjoy a quiet and relaxing Mediterranean holiday between the beach at Argelès-sur-Mer and the lovely Albères Hills. 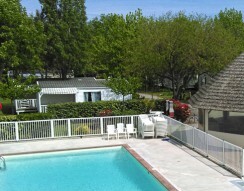 Enjoy our pool, barbeque evenings and the sound of the cicada here in the heart of the Camargue, close to the beach at Le Grau-du Roi and the Roman towns of Nîmes and Arles. 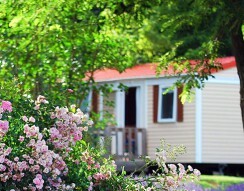 As the name says, slow down and learn to enjoy the good things in life at this small family campsite in the beautiful Périgord Noir countryside close to Sarlat and Lascaux. Discover the natural riches of the Tarn from this campsite close to Castres and the Haut-Languedoc Regional Natural Park. With their unique historical sites and magnificent natural setting, the Ariège Pyrenees make a great destination for sports lovers and romantics alike. The never-ending beaches of Soulac-sur-Mer, the Atlantic, the great forests and, of course, the world famous vineyards. 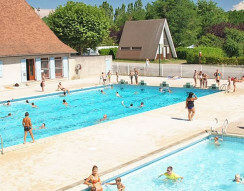 Located in the beautiful Drôme countryside, this family-friendly campsite offers a swimming pool, a range of leisure activities and evening entertainment. A heated outdoor pool, a château and all the delights of the Drôme in Hauterives, home to Fernand Cheval’s famous Palais Idéal. 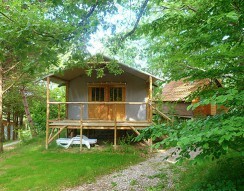 Book a stay in an Indian teepee, a Romany caravan, log cabin, Mongolian yurt or simply a luxury mobile rental in the heart of a leafy, beautiful campsite with all the facilities you need… We invite you to view the individual features and details of our campsites and find the perfect match for your holidays this year.